It's been hard work trying to finish off a couple of posts I've got on the go (OK - I ended up watching both Everton v Liverpool and Arsenal v Chelsea yesterday). Hopefully the blog-block is temporary and I'll get my mojo back soon. In the meantime here's one I made earlier - I've always wanted to use that line!. My standby post takes me back to a trip to Guangzhou earlier this year. This dirty old town - better known as Canton - is home to one of the great cuisines of the world. Treats like dim sum and bbq roast meats are rightly famous but Cantonese cuisine comes into its own with its way with seafood. The Cantonese love their seafood fresh and it doesn't get fresher than the fish market. These photos remind me of one of the best meals I've had this year as next to the market is the Jingang Haixin Jiujia which means 'Golden Harbour Seafood Restaurant' in English. It's a BYO restaurant but you're expected to bring the catch of the day rather than Chardonnay! I wasn't blogging then and for some reason I was more interested in taking photos of the market rather than the fish. But I do remember the Golden Harbour converting our carrier bags of live seafood into a veritable feast of steamed crabs, chilli salt prawns, eel hotpot, steamed fish and braised crocodile amongst other delights. Guangzhou is a great foodie city but not even its proudest citizens would big it up as a tourist destination. You also really need to be able to read Chinese as there are few bilingual menus here (I was in the capable hands of relatives). But if you're holidaying in Hong Kong, it's worth popping over to Guangzhou for a day or two – there are direct train services that take less than 2 hours. The food is arguably better than Hong Kong (and cheaper) and once there, you could do worse than kick off with a dim sum brunch at the Garden Hotel; snack on wonton noodles whilst walking through the old city streets before rounding off the day with a seafood banquet. I love fishballs but unfortunately most of the ones you get in Blighty aren't that good. Perhaps I'm spoiled as I grew up on home-made fishballs that my mum and dad made from scratch - miles better than the bought-in manufactured efforts most Chinese eateries use. Other than my parents' efforts, some of the best fishballs I've ever sampled were Fuzhou fishballs (Fuzhou yuwan). Fuzhou is the capital of Fujian province in Southeast China and their fishballs are rather special – bigger than normal with a juicy ground pork filling. I've never been to Fujian but Fuzhou fishballs are widely available in parts of the world where the Fujianese settled. I first tried them in Singapore - look for the stall in the Maxwell Rd Food Centre - and I've also eaten them in Taipei. In the West, they're quite common in New York where there is a 'Little Fuzhou' within Manhattan's Chinatown. However, I've never thought to order them in London until when I walked past the Fuzhou Restaurant on Lisle St the other day. Now I must have walked past this place countless times but never thought to check it out. Truth be told, it doesn't look too alluring from the outside and its English language menu of anglicised Chinese dishes doesn't really appeal. They have a Chinese language menu listing Fuzhou specialties but we all know the trouble I have with these. Fortunately I know the characters for fishball soup and yay it was on the menu. In my ropey Mandarin, I checked with the waiter whether these were the Fuzhou variant and double-yay they were. The portion was generous with seven large fishballs in a clear broth for a mere £5 and they were definitely own-made but there was something not quite right about this dish. The pounded fish wasn't as springy as I'd like and the ground pork filling could have been a bit juicier. I also didn't like the broth. I'm not sure what it should really taste like but I found the weird vinegary flavour too overpowering. Overall, the fishballs were OK but like many a dish you try on your travels, it never tastes quite the same at home. Verdict: I feel crap at having a bit of a pop at Fuzhou Restaurant - the fishballs might not entirely be to my taste but this is a place that serves up giant portions of a regional delicacy not widely available in London for a fiver. Other Stuff: Despite the number of Fujianese that toil away in Chinese kitchens across Britain, there are few places where you can sample their native cuisine. The only other place I've spotted is New Fuzhou on Gerrard St but alas they also hide their specials on the Chinese menu. The photo above is of the 'Chinese menu' sitting proudly outside new Chinatown opening, Wanchai Corner. I can tell you it serves 'Hong Kong specialities' and amongst the delights on the menu are stir-fried pak choi and XO mixed seafood. That's about all I can tell you as I can't read Chinese properly. I can spot a few characters but to all intents and purpose, I am illiterate. This doesn't stop waiters handing me the 'Chinese menu' as I look like I should be able to read Chinese and when I speak Cantonese, I sound like I ought to. Truth be told, I used to be embarrassed when I was handed the 'Chinese menu' and would attempt to bluff my way out of it by ordering dishes from memory or asking the waiters for advice in a nervous way that betrayed my illiteracy. Nowadays I don't really care, I realise that there are many people in my position and if anything it's the restaurant with the problem not me. One of my earlier posts was an attack on professional food critics for showing a lack of understanding of Chinese food. Thinking more about this, Chinese restaurateurs are also responsible for this state of affairs. Even the most authentic of eateries often steer their western punters to formulaic set menus with the intention of turning their tables around as quickly as possible. They might justify this practice by saying that the locals don't appreciate the finer arts of Chinese cuisine. This may have been the case sometime in the last century and whilst many Brits remain unadventurous, it frustrates me that this practice still continues. So what to do if you want to be more adventurous ? It's not practical to ask for the entire Chinese menu to be translated but you could ask for a recommendation based on your likes and dislikes. A decent restaurant should oblige but if they don't, go somewhere else, they don't deserve your custom. There is some good news as an increasing number of authentic Chinese restaurants offer all diners the same bilingual menu. These include my regular haunts of Chilli Cool, Phoenix Palace, and Hung's and whilst I can't guarantee that the food will be better, it's a good sign that they could be arsed to translate their specials and not patronise their non-Chinese reading clientele. The last word though goes to someone who has forgotten more about Chinese food than I’ll ever know, my Dad. He seldom looks at the Chinese menu; instead he'll interrogate the staff about the freshness of their produce before reeling off a list of dishes with advice on how he wants it served. The best thing is that I’m pretty sure some of the dishes he requests aren't on the menu ! Here's a quick post on a great lunch deal. Mien Tay is a Vietnamese restaurant with two branches, the original in Shoreditch and a newly opened one in Battersea. Living south of the river, I went to the latter following positive reviews by other bloggers. Their set lunch menu consists of a range of one-dish rice or noodle based meals. None cost more than £5 with free extras of prawn crackers, a bowl of egg & vegetable soup and half an orange. I went for the rice vermicelli with spring roll & chargrilled pork (bun cha gio & thit nuong). This dish is very simple with bun or rice vermicelli served at room temperature topped with spring rolls, chargrilled pork, salad and herbs accompanied with nuoc cham - a sauce consisting mainly of fish sauce and lime juice. You simply add the sauce into the bun and stir. Mien Tay's version was pretty spot on. The salad and herbs were fresh, the spring rolls weren't too oily and the pork was very flavoursome. It's not quite as good as Song Que's version as the pork isn't as juicy but I'm nitpicking. The lunch deal is amazing value and I was surprised that there were only 3 people (including me) eating here on this particular Saturday lunchtime. I'll be sure to return to Mien Tay with friends for a proper meal in the near future. For more comprehensive reviews - click on the Urbanspoon link. I was first introduced to the delights of Chinese bakery sometime in the last century when my mum would occasionally buy treats from Ho's Bakery in Manchester. By Chinese bakery, I guess I mean the cakes, pastries and buns that were developed by the Cantonese through exposure to western influences in Hong Kong and Macau. There are couple of places in Chinatown that I go to for Chinese bakery; the first is Wonderful Patisserie on Gerrard Street. The photo below shows a couple of my faves pineapple bun (bolo bao) on the left and baked bbq pork bun (cha siu chaan bao) on the right. The pineapple bun contains no pineapple and is so called because it has a crispy almost biscuit-like topping that looks like a pineapple. The soft bread in both these buns have a slightly sweet taste which is very moreish. The baked bbq pork bun should not be confused with the steamed cha siu bao that is served as dim sum although as you can see below the filling is very similar. I could have sworn there was more filling when I was little ! Other faves include banana cake (hong ziu gou) pictured left and wife's cake (lao pao beng) on the right. The banana cake is made of glutinous rice flour, banana and the red bit is red bean paste – it's very fragrant although it is an acquired taste. The wife's cake is a flaky pastry traditionally with a winter melon and almond paste filling – sounds weird but I love it. There are some faddy versions with red bean paste or lotus seed paste but I'm firmly of the view that you shouldn't mess around with the original. I sometimes visit the Golden Gate Cake Shop on Macclesfield Road (off Gerrard St) where I sampled their cocktail bun (gai mei bao) and coconut roll. Both consist of the slightly sweet tasting soft bread featured in the bbq pork bun and pineapple bun. The coconut roll (pictured right) is a new one on me and had a shredded coconut whirl - I was largely indifferent to this roll. The gai mei bao (pictured left) is one of my all-time faves with its dense sweet coconutty filling – the 1st photo below is Golden Gate's version but I prefer Wonderful’s version in the photo below that. On a recent visit to Wonderful, I sampled a couple of new pastries - sesame red paste pastry (left) and green tea pastry (right). I guess I'm a bit old school and can't say I'd buy either of these pastries again although the green tea pastry was OK.
Of the two places I prefer Wonderful Patisserie as the baking is of a higher quality and the staff are more helpful. Now when writing this post, I thought it was an original idea but I should've known better. After drafting this post, I see that Bellaphon (come back soon old boy!) had already written about Chinese bakery. You can check out his thoughts here - he went to different places and tried some different stuff. Lastly, I'd love to hear from you about your favourite Chinese cakes, pastries or buns and any tips on where to buy them from. And yes I know I've omitted egg tarts (dan taat) - it's not that I don't like them but these are best served warm as dim sum. Où sont les chopsticks ? Well three months into my blog, I've finally plucked up the courage to write a full review about food that isn't eaten with chopsticks. It's not that I don't eat with a knife and fork but I started my blog because of my passion for Chinese food and I feel enough of a charlatan writing about that never mind Western food. The other thing is that I'm a bit of a control freak and when everyone has their own dish, I feel I'm not seeing the whole picture. Throw in some bottles of wine and I'm definitely not seeing the whole picture. The victim for this post is my old flatmate who we shall call Mr Pak Choi for no reason other than that was the name he was given when we were allocating nom de blog's in the pub. Anyway PC and I often meet up for Sunday lunch in Wimbledon Village. We're not particularly imaginative and usually go to the pub for roast beef washed down with a couple of pints. We decided to try somewhere different but sadly the village is a microcosm of 'Chain Britain' albeit with the posher chains that the 'sweater over their shoulder' crowd adore e.g. Le Pain Quotidien, Strada, Pizza Express, Giraffe, Café Rouge, Tootsies, Paul, and Côte. There are non-chain options but we didn't fancy the bog-standard Thai, Indian, Chinese or the slightly bizarre South African pizza parlour. We also didn't want to go anywhere too formal or pricey, just somewhere for a relaxed lunch – how hard can that be ? Is it any wonder we always end up in the sodding pub ? We finally plumped for Côte, which defines itself as 'a modern interpretation of the many famous bistros that populate Paris'. If I was French, I'd be spluttering into my café au lait at this lame PR puff but I'm not and don't have strong feelings on what a bistro should or shouldn't be. Mind you I would 'do one' if a chain restaurant defined itself as a 'modern interpretation of the many famous dim sum restaurants that populate Hong Kong'. Like many chain restaurants, Côte has a slightly sanitised feel and you'd be hard pushed to imagine you're in Paris. But as chains go, it wasn't too bad and the place was buzzing with few empty tables when we pitched up just before 1pm. We started with rillettes (£4.85) and the warm roquefort salad (£5.35). The rillettes was nicely presented in a jar but I thought it should have tasted more 'porky and ducky'. Another minor criticism was that there wasn't enough sourdough toast to go with this pâté although the cornichons were very good. PC thought his salad was competent. For mains, PC chose steak frites (£9.95) from the weekend specials and I went for the chargrilled 'Les Landes' chicken with frites (£10.95 incld £1 for garlic butter). Although the frites were good, PC took umbrage at the little bucket that the frites were served in – I think the term to describe this begins with w and ends in -nky. The only bigger crime against potatoes is 'thick-cut chip jenga'. The steak was decent and was served medium as requested. My chicken was a tad disappointing as it can often be when eating out - I guess I was taken in by all the guff about the free range chicken being from the 'Les Landes' region of France. Thankfully the garlic butter rescued this dish together with a side of French beans (£2.95). We weren't going to do desserts but 'we took one for the blog' and I'm glad we did. PC went for chocolate fondant (£4.95) and I chose the tarte fine aux pommes (£5.15). Both of these were served with vanilla ice cream and what ice cream ! PC spotted that the ice cream was probably own-made as he could see ground vanilla pod (after a slow start, PC was getting into the blogging spirit). Whilst it tasted good, like many a Masterchef contestants’ effort, the fondant collapsed. However, my tarte was excellent - it was the one dish that transported me to France with caramelised apple and flaky pastry – incroyable ! The mainly French staff were efficient throughout and the damage came to around £70 for two including service and a fine bottle of La Garenne Syrah 2008, Vin De Pays D'Oc (£18.95). It was a bit pricier than our normal pub lunch but not overly expensive for Wimbledon Village. However you could get away with spending around £20/head ordering the weekend special with house wine. Verdict: Casting aside my prejudices about chains, I liked Côte and whilst it wasn't flawless, it made a nice change from our usual Sunday lunch routine. Other Stuff: Breakfast is served until noon (1pm at weekends) and next time I might go for the full English (£7.35) or a croque monsieur (£4.85). It's time to take stock on my soup noodle odyssey which has taken me from Southern China, through Malaysia, Vietnam, Thailand, back through Hong Kong before ending up in Japan, all without leaving Zone 1 ! If you want to check out the original review, just click-through on the restaurant name. Of the six places I tried, there was only one winner, Song Que, a Vietnamese caff on the Kingsland Road in Shoreditch. Their pho tai nam - a generous bowl of beefy soup, rice noodles and two types of beef (rare steak and well done flank) was truly memorable. Other dishes such as goi cuon (summer rolls) and bun (rice vermicelli) are also very good here. 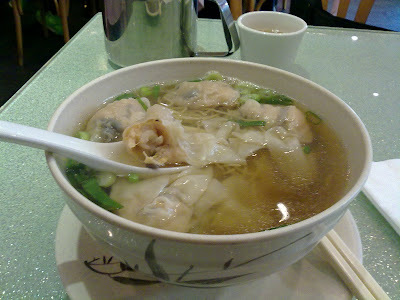 Chinatown is a great place for soup noodles and my favourite for Cantonese classics like wonton noodle soup and their signature dish of king prawn dumpling noodles (pictured below) is Hung's. If you don’t fancy Cantonese noodles then Malaysian/Singaporean eatery, Rasa Sayang is a good option although their prawn noodles (pictured below) were a bit disappointing. Their fried fish vermicelli is a better soup noodle option. One place I won't be returning to is HK Diner where their fishball noodles quite literally left a nasty taste in the mouth. Ramen Seto is an unpretentious Japanese caff and I enjoyed their chicken negi ramen although I'm left wondering if my intake of red wine the night before enhanced the experience. Another place, I won't be returning to for soup noodles is Busaba Eathai - £10.50 for tom yum talay is criminal especially for such a meagre portion. With a couple of exceptions, I've enjoyed my soup noodles tour but it's time for a breather. In the meantime, I'll be blogging on some other topics but I will be back on the soup noodle trail in the New Year - any suggestions for Part 2 are most welcome.